Today we attended the first Rafaelo list at the Royal Hampshire County NHS Hospital. Mr Jack Broadhurst FRCS and Mr Tim Moore FRCS have jointly introduced Rafaelo to the NHS in Winchester and today their first 5 patients were successfully treated. The speed of the treatment, coupled with the extremely efficient team which managed the patient changeovers, meant that we even finished the list early! Everyone was delighted with the way it went and we look forward to supporting the team again very soon. Two more surgeons, Mr Haney Youssef FRCS and Mr Rajeev Peravali FRCS both now offer The Rafaelo Procedure at Spire Little Aston in the West Midlands. Today we supported Mr Youssef’s first session with his next planned for 8th April, where 4 four patients are already on the list. This week, Rafaelo launched a poster campaign at a number of motorway service stations up and down the Country alerting haemorrhoid sufferers that there is an alternative to the horrors of haemorrhoidectomies and that they needn’t suffer any more. Ramsay Healthcare joins the Rafaelo Revolution! 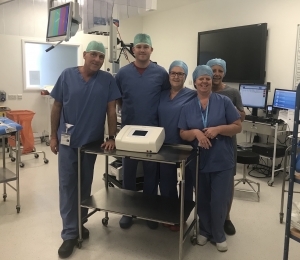 Mr Denzil May FRCS, Consultant Colorectal Surgeon, is soon to begin offering The Rafaelo Procedure from Duchy Hospital, Truro, part of the Ramsay Healthcare Group – extending the national coverage of Rafaelo from Glasgow down to Truro. https://rafaelo.co.uk/wp-content/uploads/2016/11/Rafaelo-Procedure-Logo-300x112.png 0 0 Rafaelo_admin https://rafaelo.co.uk/wp-content/uploads/2016/11/Rafaelo-Procedure-Logo-300x112.png Rafaelo_admin2018-09-19 10:41:052018-09-19 10:41:05Ramsay Healthcare joins the Rafaelo Revolution!